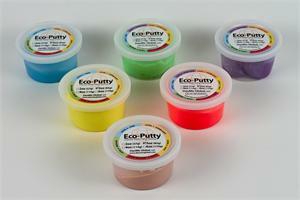 Eco-Putty™ is available in 6 different resistances from super soft to firm. It comes in: 2 oz, 3, oz, 4 oz, 6 oz, 1 lbs and 5 lbs plastic containers/tubs. Build muscle strength and range of motion using different exercises. Putty is the ideal Hand training device/tool allowing for a full range of motion while at the same time providing the option to create exercises for both extension and flexion.